One of the rare drawbacks of having a cat is probably having to clean out the litter box. Cleaning it requires some motivation and it also needs to be done quite regularly (once a day is best). It might be annoying but it is a minor inconvenience when compared to the daily care for a dog. At least your beast is independent and can take care of his own business without your help. The only help needed is in the cleaning/emptying process of your litter box. 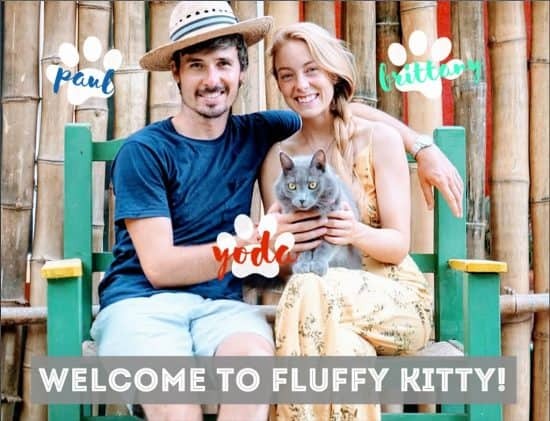 Thanks to us, this dreadful task will be made easier 🙂 Just for our readers, Fluffy Kitty has selected the best cat litter scooper (or “pooper scooper” as we like to call it) and we give you some advice on how to clean your litter box! When buying a cat litter scooper, there are only a few things you need to pay attention to: The shape, the size of the holes, the material, and also the length of the handle. Some scoopers are simply easier to use than others and we want to make sure you know what you are getting into. Now it’s not like you are trying to buy an expensive camera with tons of details to be mindful of. No need to be a rocket scientist to find the best cat litter scooper for you, just follow our simple checklist. The shape: no need for a fancy shape to do the job. The good ole litter scooper is simple and goes in every corner of a regular litter box. That’s all. The size of the holes: if they are too small they will not sift efficiently, if they are too big the scooper will loose its efficiency and wont get all the tiny dirty pieces. The material: excrements are not that heavy but it’s important to have a quality made product that you can trust through time. It’s already tedious enough to take care of the cleaning without having to constantly reinvest in the tools that should be made to help you out. The length of the handle: back problems? Try to choose a long or even extra long handle cat litter scoop. The type of litter you are using: if you have a litter that does not clump well or has a weird texture, some scoopers might not work as well. If you find a scooper answering every single one of this criteria, then you have a winner that can take care of your beast’s waste. The most basic cat litter scooper on the market ! Yet, it is remarkably efficient at doing its job. For less than $10 it’s the best cat litter scooper that is made of plastic. It even gets the small clumps! *However, Paul and I use a simple scooping technique that ensures the urine clumps do not mix with the clean litter, and it only takes a few minutes, tops! Try it out and see for yourself! What we do: Tilt the litter box to one side (or one corner) which will expose the urine clumps. Scoop it out while it’s alienated from the rest of the litter. Do this until the bottom of the litter box is clump-free all over. By tilting the litter box to where the clean litter is separated from the dirty pee clumps, you will keep the litter fresh and odor-free by ensuring that the clumps do not mix with the clean litter as you scoop it out. This will also help you ultimately use less litter which = less money spent on litter overtime. The only bad thing about it is that it is made of plastic. Although it is made of a very durable plastic, it stays plastic and after a while plastic tends to get more fragile. Wash the scooper about once a week or when it gets too dirty. The rolls royce of pooper scoopers. It really has the best design, efficiency and resistance to time. Like they say, it makes a nasty job less nasty 🙂 It has everything you need in a pooper scooper: it is super resistant, light weight, it has a generous size, it has a very comfortable handle and is equipped with anti-scatter sides. Seriously, for a few more dollars, you get a top notch product that you can trust. Do not fear to break the handle when using this scoop to remove clumps that get cemented to the cat box bottom. The Purrr-fect scoop is the one you are looking for. 34″ ! Yep that’s right, you barely have to bend to use this scooper. Comfortable and easy to use with its D handle, you will enjoy its remarkable maneuverability. 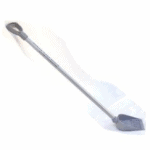 The scooper is a combination of steel and polymers for maximum strength and resistance. Check out this little video on how to use it and make sure to check out the awesome reviews of the hundreds of people that already saved their back with this precious tool. 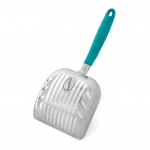 It is literally the sturdiest cat litter scoop that we have found on the market. 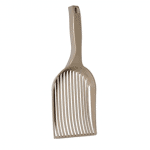 If you suffer from severe back pain or any condition that prevent you from bending in order to clean the litter box, you can trust this extra long handle cat litter scoop. If you are fond of DIY projects, make sure to check out this one at instructables.com! This guy made a sifting bucket that works like a charm. It does require some extra space since this device is bigger than a regular scooper and needs to be stored somewhere. But it’s brilliant and does not cost much, we definitely recommend you to check it out. Have any DIY of this kind? Please leave a comment, we’ll be happy to integrate it to the page! Did you find the precious gem? We do hope so and we are very happy if you did. 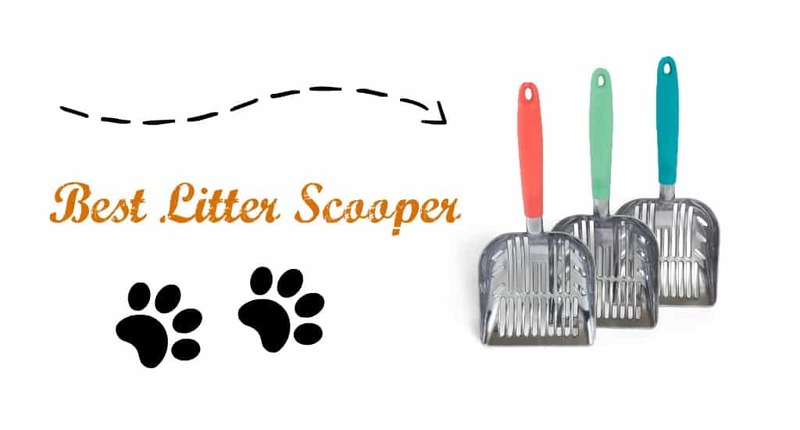 All cat lovers are looking for a scooper that scoops quickly and keeps most of the pieces in there, all while letting the unused litter drop through quickly. Choose one of our recommended cat litter scoopers and you won’t be disappointed. Let us know which one you picked! How did it work out for you? Next Post Can 2 Cats Share a Litter Box?